Iceland's eruptions, 2010: Getting close safely for measurements was one of the problems with observing the initial eruption conditions that affect plume dispersion modeling. The Eyjafjallajökull volcano eruption in Iceland lasted from the 15 April to 25 May 2010. In addition to threatening local people and their livestock, the volcano sent an ash plume to heights of up to 26,000 feet. Due to the weather conditions, the plume spread over a large part of Europe. Because volcanic ash can cause airplane engines to fail, the plume disrupted aviation over several weeks. Weather Services played a key role in predicting the spread of the ash and advising the aviation industry. The forecasts were based on safety thresholds for flying through volcanic ash set by the International Civil Aviation Organisation (ICAO) along with the national aviation authorities and aircraft manufacturers. Scientists modelled the evolution of the ash cloud using dispersion models and trajectory models. The model predictions were compared with observations from satellites, aircraft and ground-based networks. 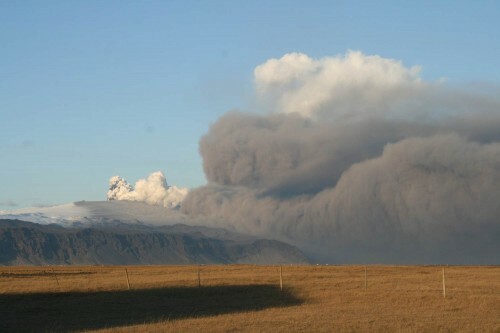 The eruption of Eyjafjallajökull presented challenges to the meteorological community, especially in Europe. The event highlighted the importance of enhanced international coordination to ensure a consistency of approach in the observation, forecasting and dissemination of volcanic ash information and warnings. •Ash deposition close to the volcano i.e. ash that is not available to be transported. Unlike atmospheric phenomena, volcanic eruptions are in fixed places and don’t condense or disappear out of thin air, like atmospheric phenomena…but apparently observing them isn’t much easier.